Authors Note: I was going to name writers in this article, but most didn’t want their names used. Many said they were embarrassed. I was also going to name names of pay-per-click sites, but none of the writers who responded to the survey said anything that made me want to endorse any of the firms. If I were impressed with any of the sites reported on, I’d have mentioned them. Unfortunately, I was not. Even if only one writer had written in about impressive income from a pay-per-click site (none did), they would have been the extreme exception to the rule. To be more than fair, I am posting the most positive response we received as this week’s Freelance Success Story. I received an email yesterday titled “Everyone can write, publish & earn rewards.” Sounds like an ad for frequent flier miles, doesn’t it? I knew what it was about, so I opened it feeling anxious to slam a site that believes writers don’t deserve to earn money for a living. The first line read, “I thought you would be very interested in a new website that has just launched…” It goes on to say the site “allows” writers to contribute their work in any area that interests them, that it doesn’t moderate the content it publishes (meaning the content is likely crap) and that you can earn rewards for letting them publish your work. Hoo boy! I take out all my frustrations for an entire week on companies like this!! We never endorse sites that pay writers per click. We only endorse sites that pay writers real money for real content. We’ll be sure to tell our readers to stay away from your site, though. Let us know when you can afford to pay people enough to keep their families fed. Writers are professionals, too, and deserve more than a few pennies per read. 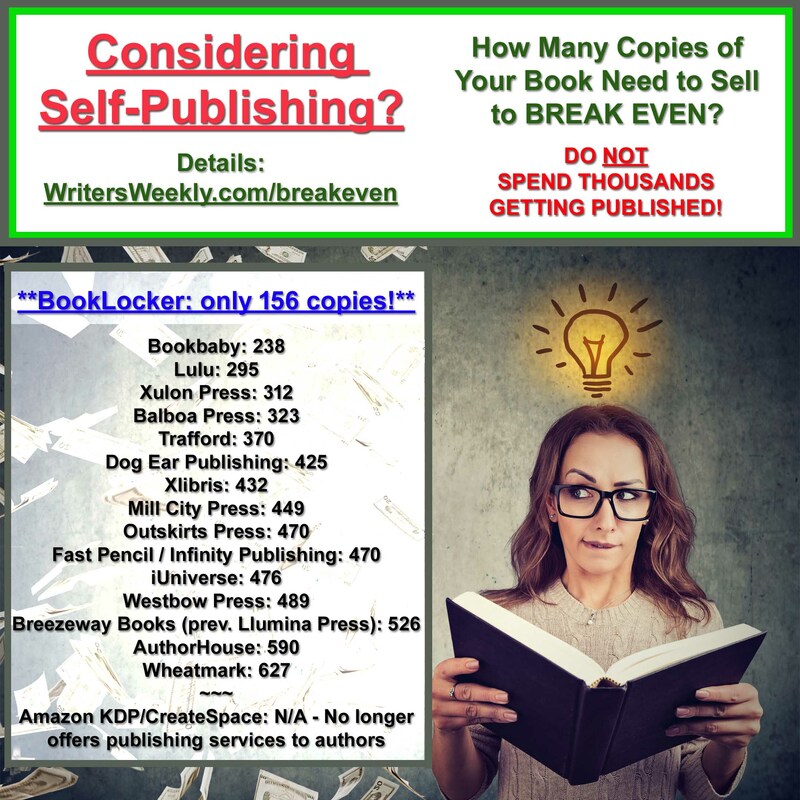 Real publications and websites pay writers real money. You should, too. I am sorry you feel this way, from our experience we know there are allot of writers that do not have an opportunity to be payed for all their work. Yeah, right. Are you laughing as hard as I did? I wouldn’t trust my mouse pad with this guy. Pay-per-click sites typically pay contributors (writers) a percentage of the advertising revenue, or a flat fee, for every unique visitor that clicks through to the contributor’s article online. The fees range from a penny or less to a dime or more. Some of these sites offer to divide advertising revenue among their contributors depending on which articles get the most clicks. Last month, a woman sent me multiple emails asking me (and everyone on her mailing list) to click on her article at (a site I’ve heard LOTS of complaints about lately) because she’d earn a lousy dime if we did. I finally asked her to take me off her friends and family spam list. It was insulting and, frankly, she came off looking like a beggar. WHAT ABOUT SITES THAT PAY A FLAT FEE? Yes, these pay-per-click clips have occasionally led to other, higher-paying gigs, but we only received a handful of letters stating so. BEGINNERS DON’T NEED TO WRITE FOR FREE! You don’t need to write for free or almost-free to collect clips. There are lots of legitimate, paying websites and magazines that pay real money to new writers who have no clips. Don’t believe me? Simply search for the words “welcomes new writers” at my paying markets page. I did and found 51 paying markets that welcome new writers. And that’s only the first page of our markets! Let’s face it. Reputable editors that pay respectable fees to writers are not surfing the ‘Net looking for writers! They have enough query letters on their desk to keep them busy for months! One writer wrote to say she not only was paid very little, but also found her articles on another website. Without her knowledge, the site sold her articles to another. Some pay-per-click sites take rights away from writers. The site is then free to sell the articles to other companies and there’s nothing a writer can do about it after signing their contract. One writer told me she found her material on a syndicate website where it was posted for free. She was making nothing per click there, but she had signed a contract and she was out of luck. Some sites might not take all your rights away, but may instead limit your future sales. So how much money are writers really making at pay-per-click sites? Websites need content to survive. Content costs money. Content generates money. Sites that pay-per-click promise content providers money later…after delivery of the content and delivery of clicks. It’s a vicious cycle and a game that poor people shouldn’t play. Companies that can’t afford to pay their contractors (writers) should NOT be in business. The most anyone who responded to our survey made (see above) was almost $3,000…for 263 articles. Do the math. We ran the survey for two weeks in a row to more than 30,000 freelance writers. Our distribution to mailing lists and discussion groups is estimated at twice that number. Nobody who responded to our survey has made enough to feed their family. If you saw all the complaint emails I receive about pay-per-click sites, you’d jump on my soapbox, too. In addition, I am appalled at the amount of spamming going on by their contributors. Writers are begging people to click so they can make a few pennies. This is not real writing. This is a travesty. One writer wrote to tell me the only people clicking on her articles are the site’s other contributors. 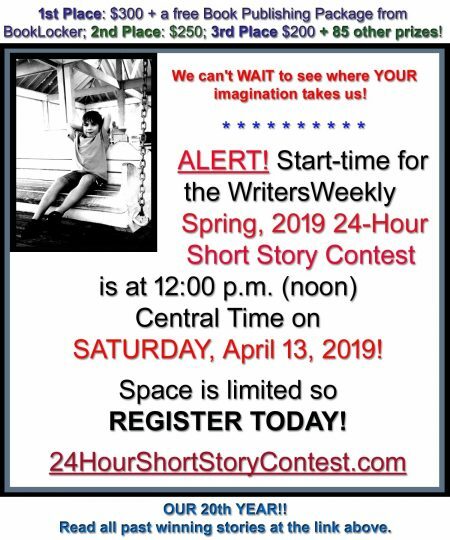 The writers swap clicks to help each other earn money…one dime at a time (oh, if the advertisers only knew!). Writing for pay-per-click sites is no different than posting your freelance paycheck online for the world to see. Thank you for that dime, sir! May I have another?! Whoever came up with the idea that writers are different from every other professional? Why must writers work for payment for pennies-per-click, or for nothing at all, when everyone else gets paid a real paycheck for what they do? Why is getting published considered an honor instead of a good day’s work? No matter how many times I smack my palm against my forehead, I just can NOT understand how this perception every came to be! But I damn well know what I can do to change it! And I’m doing it now. REAL publishers pay writers REAL money. Join me in shutting out the rest. + We’ll pay you IF…anything! Do you only pay your babysitter IF you sold an article this week? Do you only pay your doctor IF you get well? As with every other profession, you deserve and should EXPECT a decent wage for your blood, sweat and tears. Only write for publications that offer real money for your work, either by the word, by the article, or by the hour. You’re worth it! 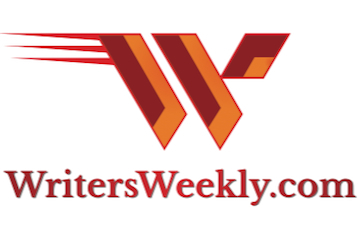 To find publications that pay real money for real content, see our wealth of paying markets here: http://www.writersweekly.com/markets/markets.html. Many markets listed on our markets pages warmly welcome new writers. No clips required. 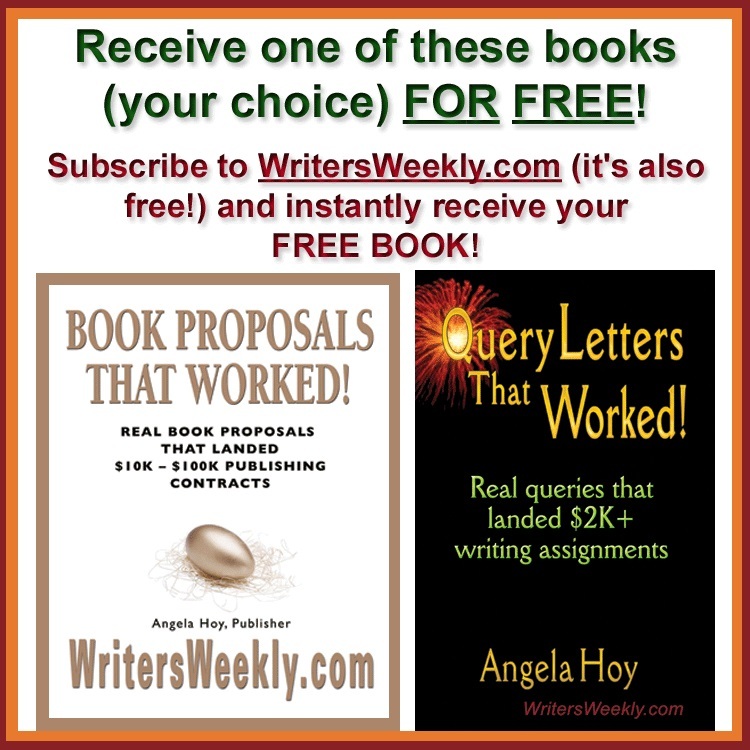 Angela Adair-Hoy is the publisher of WritersWeekly.com, the FREE marketing emag for writers featuring freelance jobs and paying markets. New subscribers receive the FREE ebook, How to Be a Freelance Writer (with 103 paying markets). Surf to: http://www.writersweekly.com.